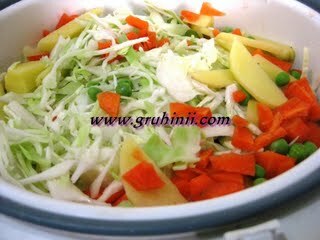 Add a tea spoon of salt and steam all the veggies together in a pressure cooker for 2 whistles and keep aside. Now heat oil in a pan. Add rai, jeera, urad dal and red chillies to it. 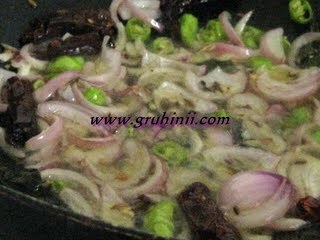 Stir, when the rai starts spluttering add diced onions, green chillies, garlic pods and curry leaves to it. Fry until the onions become translucent. 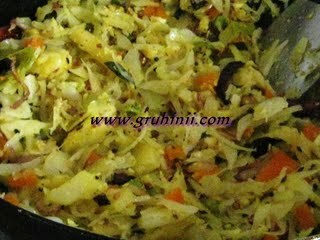 Now add haldi powder mix and fry for a while and add the steamed veggies to it.